Nick Hexum, the front man of US rock band 311, has spoken of his love for Gibson guitars. Speaking ahead of the release of the group's new album, Hexum said he has many different favorite Gibson electric guitars - including Les Pauls in particular. Some of these could be appearing on the upcoming record Up lifter, which he described as a diverse collection of songs. "The guitar solos are sick and I think me and Tim Mahoney really raised the bar in that department," Hexum commented. He added that at the age of 38, he is still taking guitar lessons. Hexum said this is because music is a "never-ending journey", which means that musicians can never stop learning new things. The band's new album, which has been produced by Bob Rock, includes 12 new tracks and will be released next month. 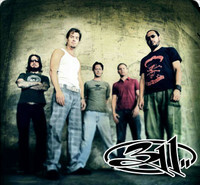 Fans can currently get a sneak preview of the songs on the 311 MySpace page. Join in and write your own page! It's easy to do. How? Simply click here to return to Electric Guitar Gear.